The final act of Power Rangers is everything you could want from a Power Rangers movie. It’s fun, funny, action-packed, and filled with so many Zords and monsters that you’ll actually feel like you’re watching a big-budget update of the popular kids’ franchise. The problem is that the 90 minutes preceding it wants as little to do with the Power Rangers as possible. For its majority, Power Rangers is a heavy-handed, character-forward teen drama with a little bit of Rangers stuff sprinkled in. It’s way, way less interested in the characters as color-coded superheroes than it is with their struggles to grow up and accept the responsibility of being Power Rangers. It’s not a bad story, but it’s so devoted to its teen drama it doesn’t have time for fighting and Zords and everything that makes the franchise fun, so overall the movie feels wildly uneven and, ultimately, disappointing. 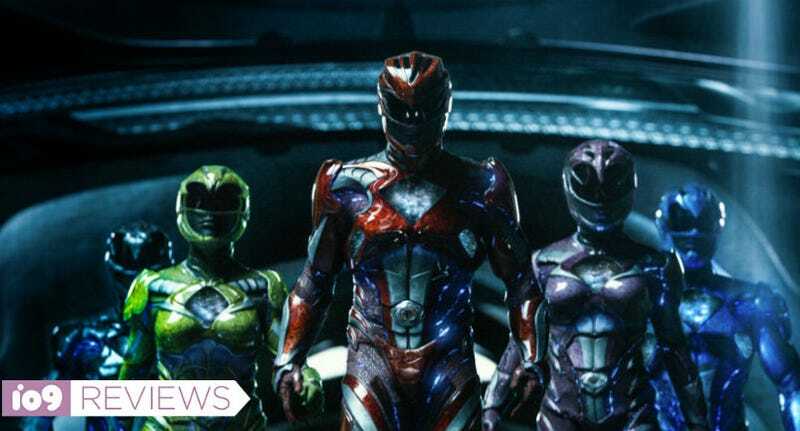 As you could tell right from the characters’ muted, overcomplicated uniforms, it’s obvious director Dean Israelite (Project Almanac) didn’t want to make a bright, colorful Power Rangers movie. After a promising, yet dark, prologue featuring Bryan Cranston’s Zordon and Elizabeth Banks’ Rita, we meet Jason (Dacre Montgomery) as he’s committing a crime and getting into a violent car accident. The film then cuts to black and the words “Power Rangers” appear in a very small font in the bottom corner of the screen—it’s the opening of a Steven Soderbergh movie, not a Power Rangers one. From there, we follow Jason as he goes into detention, meets a few fellow outcasts and, eventually, they all haphazardly meet at a rock quarry almost an hour outside of their town. There they find the power coins and begin their journey to becoming Power Rangers. Cyler, Montgomery, G., Lin, and Scott are the Power Rangers. As this is all happening, it’s obvious from the realistic setting and muted visuals that the film is taking the material incredibly seriously. Yes, it gets to the Power Rangers stuff fairly quickly but it all feels secondary to the teenagers’ problems. Zack (Ludi Lin) has a sick mother. Trini’s (Becky G.) parents don’t understand who she truly is. Kimberly (Naomi Scott) is dealing with a bad case of cyber-bullying and Billy (R.J. Cyler) is ostracized because he’s on the spectrum. Add that to Jason’s problem of throwing his life away for a dumb prank and these kids obviously have some issues. This could have been a great parallel, right? They need to deal with their personal problems and the difficulties of becoming Power Rangers simultaneously, and these conflicts could have informed each other. But at almost every turn the Power Ranger training and mythology plays back-up to the teen drama. There’s rarely a sense of “wow” early in the film and the characters almost never think about the bigger picture of the world being in danger. They are so laser-focused on their small-town lives and high school problems that it seems like they barely care about becoming Power Rangers or saving the world. They say they care, but the movie doesn’t show any evidence of it. And since they don’t care, neither do we. It all just ends up making the film feel super slow, with the exception of a training montage or two. But once you get past all that the kids finally put on the costumes and jump into action. At this point, the audience I saw the film with cheered, because the movie has finally delivered on its promise. It’s the Power Rangers! Zords! Rita! Goldar! Fighting! But something is off... literally. The kids don’t wear their iconic masks, so we can see their faces almost the whole time. Even in this huge, ludicrous action scene, the film refuses to fully embrace the mystique of the Power Rangers. Elizabeth Banks is the only one in the film who gets it. To their credit, the cast does their best in their roles. Elizabeth Banks seems to be the only person aware she’s in a Power Rangers movie and she acts with pure, devilish delight. The kids all embody their characters fairly well, too; obviously, the script was written to give them maximum room to grow as characters in the film and they do just that. R.J. Cyler’s Billy, in particular, is a character that’s the audience can latch on too. It’s just a shame they weren’t given the same memo as Banks that this franchise is less The Breakfast Club and more monsters and robots. Despite the fun of the third act, it can’t erase those first 90 minutes, and the harsh tonal shift between the two. It’s hard to imagine that young kids—arguably the prime Power Rangers audience—would enjoy sitting through all that talking and angst before getting to the good stuff, although maybe they will. Maybe for kids, the teen heroes are simple and charismatic enough that they’ll latch onto and look up to them, sympathize with their problems and truly felt the evolution when they become Power Rangers. Maybe. But walking out of the movie I had a revelation: The problem with Power Rangers is that it establishes a world where five kids in robot dinosaurs don’t belong. In a film devoted to exploring Billy, Jason, Kimberly, Zack, and Trini’s teenage angst, somehow it’s the Rangers who end up not fitting in.